I’ve made it a habit that after reading and reviewing a whopping big novel, I like to follow it up with an anthology. Sort of allowing my literary palette to enjoy smaller treats after having digested a weighty tome. With anthologies one can read them at a leisurely pace, choosing one or two tales every few days and not worry about remembering a single narrative over a long period of time. 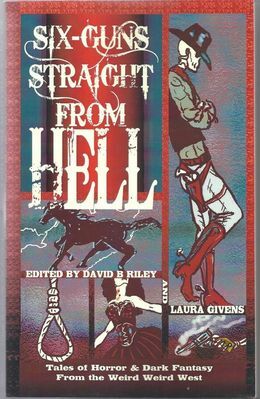 This I picked up “Six-Guns Straight From Hell,” a collection of weird western stories produced locally here in Colorado by editors David Riley and Laura Givens. Now deciding whether any anthology is good or bad is simply a matter of mathematics. If the collection has more good stories than bad ones, it’s a good book and just the opposite if the clunkers outnumber the decent yarns. This volume contained a total of twenty stories and in the end the break down was four truly great pieces, ten good ones and six duds. Ergo, an excellent package all around, to include Laura Given’s humorous cover which tips its Stetson to the old TV series, the Wild Wild West. Among the stellar quartet was “Chin Song Ping & the Fifty Three Thieves” by editor Givens. It’s the first story and my personal favorite. A Chinese rift on the Arabian legend of Ali Baba with a little Jackie Chan kung fu humor thrown in for good measure. Original, surprising and fun, it has all the elements to make you glad you picked this book up. Whereas “The Road to Bodie” is a sensitive drama about a young Mexican woman caught between two untenable situations, desperate to take her widowed mother and flee to a better life in Texas. And then there’s “The Enterprising Necromancer,” about a shrewd fellow whose business is raising the dead. A deliciously twisted fable that had me chuckling aloud. The final gem is “Snake Oil” by Jennifer Campbell Hicks about an elixir salesmen who arrives in town in a new, fancy dirigible. Without listing all the other ten tales that I liked, let me add honorable mentions to David Boop’s “Bleeding the Bank Dry,” “The Last Defenders,” by Carol Hightshoe, “Smile” by Kit Voker and “A Specter in the Light,” by David Lee Summers. 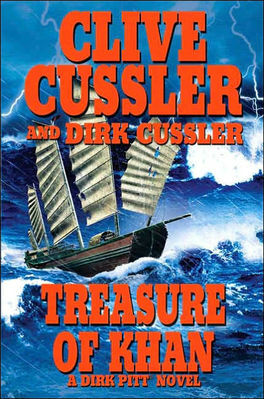 Coupled with the others, these adventures into the strange and scary west all proved to be entertaining. As for those I labeled duds, you’ll just have to pick those out yourself. All art is subjective and who knows, maybe one of them will tickle your particular fancy. The bottom line here is “Six-Guns Straight From Hell” is a solid, marvelous anthology for those of you who like to mix your genres. So grab a copy, load your six-shooters and saddle up for some macabre adventures. It’s one “Hell” of a ride. Calling this thick hunk of book the “Gone With The Wind” of pulps would be no exaggeration at all. Detailing, and intertwining the lives of dozens of heroes and villains from both the 19th and 20th centuries, Wayne Reinagel has delivered a book that is pure treasure chest of action and adventure delights. With KHAN DYNASTY, Reinagel takes a jump backward in time to showcase the birth of America’s most famous pulp and comic book heroes of the 1930s. To do so he weaves such classic figures as Jekyll and Hyde, Sherlock Holmes and Fu Manchu together in an incredible globe spanning saga; although some have their names changed due to licensing restrictions. Still the acute pulp fan will easily identify such stalwarts as Doc Titan and his five loyal companions, the Darkness, the warrior who fights in the shadows and the deadly Scorpion, who’s automatics blaze a trail of death and destruction in meting justice to evil doers. These were the same characters we were first introduced to in PULP HEROES – MORE THAN MORTAL, his first entry in this mammoth trilogy; although it is the second chapter of the saga. We personally wish he would have launched this Magnus Opus with this volume for several reasons. The obvious would have been the natural progression of the characters’ history would have made following events a whole lot easier. Secondly, as much as we enjoyed MORE THAN MORTAL, it had many narrative bumps. We were thrilled to see these gone in KHAN DYNASTY as Reinagel’s earlier amateurish style and awkward phrasing have been replaced by a smooth, easy and very professional writing competency. This bodes very well for his proposed third volume due out later this year. No one does historical research better than Reinagel and his books are clearly the results of hours of meticulous study. Having embraced the late Philip Jose Farmer’s wonderful Wold Newton concept of classic heroes and villains being somehow related to each other via one amazing family tree, Reinagel takes that supposition one giant step further and details every single minutia on every single branch of that tree. Which is also the book’s clear weakness in that he is easily tempted by factual history and spends way too many pages relating little known historical data that have absolutely no relevancy on the book’s plot. This volume could have trimmed fifty pages of such fat and moved things along at a faster clip. But don’t get me wrong, there’s still tons of action and adventure packed into this story, more then enough for any ten regular pulp novels. Clearly, books like KHAN DYNASTY are not for the casual reader just discovering pulps. Whereas, if you are a true fan who has rudimentary knowledge of this unique literary genre and its more famous characters, then it would behoove you to pick this up. It will provide you with a reading experience unlike any you’ve ever enjoyed before. Bravo, Mr.Reinagel. Bravo!